In this activity, students retrieve two short papers from Penn State's library e-reserves, read them, and spend a week discussing them with their classmates and me. They reproduce three plots with graphing software of their choice and submit their plots to an electronic dropbox. They take a quiz housed within Penn State's course management system. As part of this quiz, they use an online drawing tool to sketch a diagram. 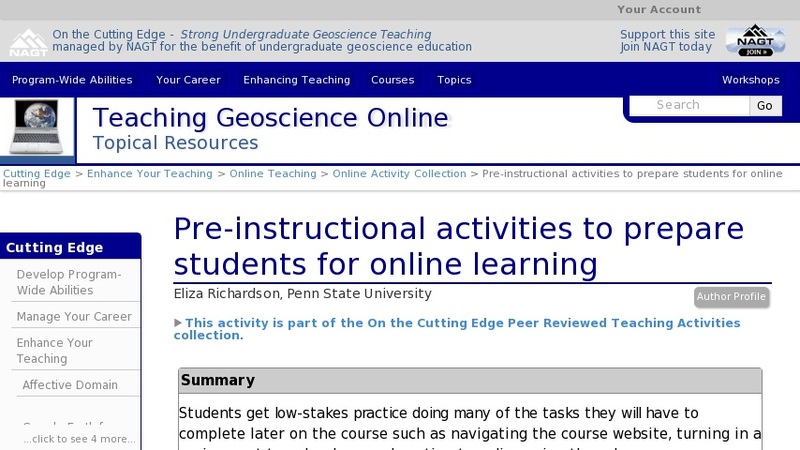 Teaching Tips Adaptations that allow this activity to be successful in an online environment This activity was created specifically for an online course. As more and more face-to-face courses incorporate technology for reserved reading and turning in assignments, this kind of activity could be useful an any course. Elements of this activity that are most effective This activity is extremely instructive for me to have an early gauge regarding the skill level of my students in terms of general online savviness as well as a bit about their quantitative skills and content knowledge. Recommendations for other faculty adapting this activity to their own course: Make sure you tailor an activity like this one to your own specific course management system. I also recommend making it completely low stakes. I grade only on participation. Log in frequently during this activity to offer help, advice, and encouragement because this is very important at the beginning of an online course when there is the most confusion. I usually make this activity last for the first whole week of courses in case some students register at the last minute.